When the creator of a virtual reality world called the OASIS dies, he releases a video in which he challenges all OASIS users to find his Easter Egg, which will give the finder his fortune. Directed by Steven Spielberg. 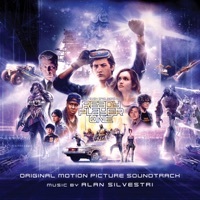 The Ready Player One Soundtrack is composed by Alan Silvestri. Columbus, Ohio 2045 - Wade climbs down from his home, past various people in the Oasis and is greeted by Mrs. Gilmore, then enters his hideaway and goes into the Oasis. Wade talks about the creation of the Oasis. Parzival walks through the Oasis while talking about the Gunters and Sixers. Parzival and Art3mis are talking while Aech fixes her bike. Parzival goes to check out one of Halliday's journals. Parzival and Aech go shopping; Wade unpacks his new equipment. Parzival is surrounded by fans in the Oasis. Parzival tries on different outfits for his meeting with Art3mis. Parzival arrives at The Distracted Globe dance club, then he and Art3mis compliment each other's outfits; I-R0k listens in on Art3mis and Parzival and she explains her theory about the club. Parzival changes the music, then he and Art3mis dance. 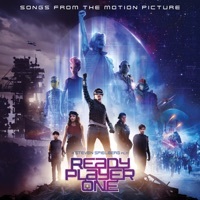 Parzival uses a Zemeckis Cube to turn back time. The group go into The Shining to search for the second key. The group head to the ballroom; Art3mis asks Kiera to dance. After Art3mis takes down the shield, all the players rush in to battle the Sixers.